St Vincent’s Private Hospital Sydney have opened a brand new, 15-storey wing, the culmination of the first stage of a complete redevelopment. The Sr Francis McGuigan wing, to be known as the Sr Francis wing, offers bigger patient rooms, more consulting suites, new sophisticated operating theatres and for the first time, a new on-site rehabilitation service. Hospital CEO, Tim Daniel, said the work was vital for providing ongoing, quality care for patients. “The new wing has four levels of patient care, two operating theatres – including a cardio-thoracic theatre – as well as new staff and public areas, a café and a new laundry as well,” he said. The rehabilitation floor features a gym and a hydrotherapy pool. “Everything about this wing features the style, the class and the quality that St Vincent’s is known for,” Mr Daniel said. The Sr Francis wing is part of a planned refurbishment of the entire hospital due to be completed by mid-2020. “By the time this is finished, we’ll have 320 single-bed rooms in the hospital – we’re basically building a brand new hospital inside the old one,” Mr Daniel said. “All the features and style of the Sr Francis wing will be carried through the rest of the hospital, all top quality from the main entrance right through – it’s been described as having a ‘Langham hotel’ look. Mr Daniel added the redevelopment was very exciting. “It’s the people inside that make a hospital, not the building itself, but this new upgraded facility will be of great benefit to our staff and our patients,” he said. “The staff really have been incredible through this whole (building) process – our doctors, everyone. “And our patients as well, they’ve all been amazing. Named after one of the founding Sisters of the hospital, construction on the Sr Francis wing started in November 2015. The hospital’s supporters contributed more than $43 million towards the $150 million extension and refurbishment of the existing hospital. 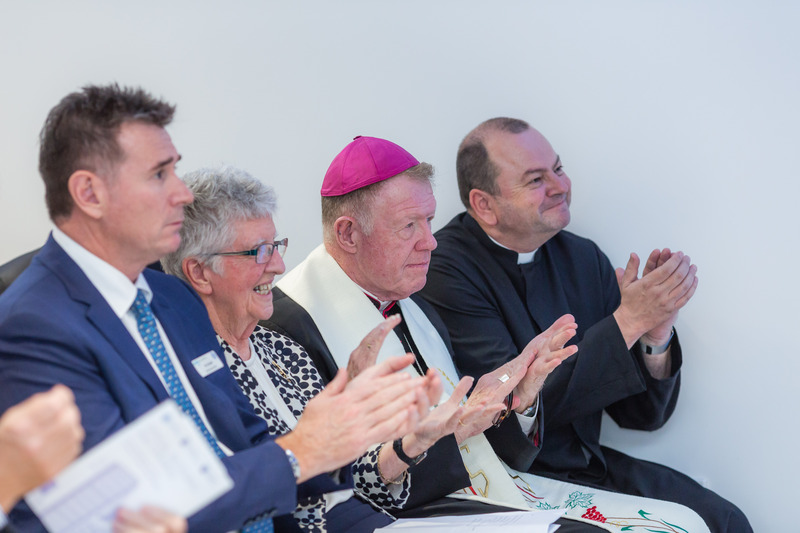 The opening of the new wing was celebrated at an event earlier this month, which included unveiling a portrait of long-term supporter Ros Packer, who is patron of the Friends of St Vincent’s Private Hospital.